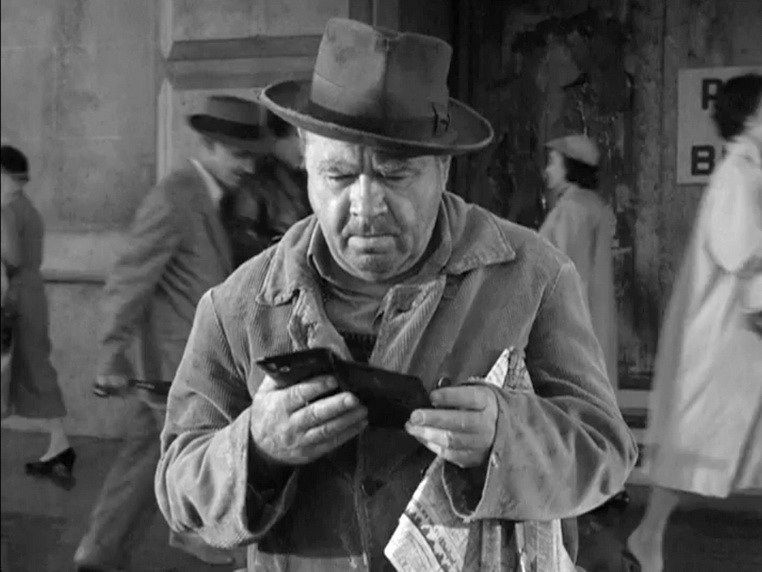 “Reward to Finder”, an episode on the Alfred Hitchcock Presents television anthology series (Season 3, Episode 6), is a tale of people who become consumed by greed. Scripted by Frank Gabrielson based on F. J. Smith’s story, the episode was directed by James Neilson. It stars two well-known stage and screen character actors, Oskar Homolka (who had earlier starred in the 1936 Hitchcock thriller, Sabotage) and Jo Van Fleet. The narrative is exclusively focused on a poor, elderly couple, Carl and Anna Kaminsky, living in a small, dingy city apartment. Carl Kaminsky (Oskar Homolka) works as a low-paid building custodian, and he is so impecunious that he doesn’t buy a newspaper, he picks up discarded copies that have been left on the street. One day while picking up a paper out of the gutter, he finds a wallet loaded with cash. 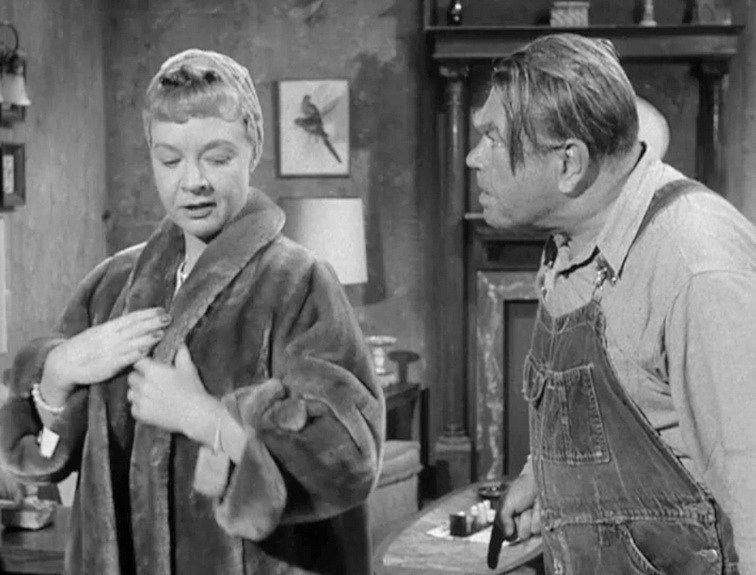 When he comes home, Anna (Jo Van Fleet) wonders why her husband is less grouchy than usual and asks him why. He coyly and contemptuously shows off the wallet, which contain no identification but has 52 $100 bills stuffed inside (worth about $50,000 today). Over Carl’s grousing objections, Anna insists that the only conscionable thing for them to do is to check the newspaper notices to see if there is a reward offered for a lost wallet and return it to its rightful owner. Sure enough there is such a listing for a lost wallet on the street corner where Carl found his wallet parcel. And from a chance encounter with a local policeman, they also learn that finding lost property and not making an effort to find its owner or returning it to the police is a criminal offence. So Carl reluctantly promises Anna that he will return the wallet to the advertised owner. Of course, we doubt that the greedy old man will return the wallet, even though he reports back to his wife the next day that he did return it and got no compensation for finding it. Two weeks later, though, Anna notices in the newspaper listings that the wallet is still missing. She knows that her husband has lied to her. Up to this point in the story, Carl has seemed like a selfish man who abusively scorns his wife, while Anna seems to be just the innocent victim of her irascible husband’s temper tantrums. But as she ponders more about the money, Anna starts thinking about what it could do to change her own miserable life. So she confronts her husband and demands that he include her in on the take – or else she will report him to the police. Carl is helpless to deny her demand, and Anna quickly goes off on a shopping spree, buying expensive home furnishings and women’s glamor and makeup kits. When she soon returns wearing a mink coat, Carl knows that his wife’s greedy splurges are fully out of control. The problem with these characters, as intended elements of a compelling story, is that neither one captures our sympathies. Much of this episode’s screen time is devoted to showing Carl and Anna peevishly quarreling with each other. In fact Anna and Carl are both obsessed with themselves, and whatever trace of marital love they may once have shared has long since vanished. Now the only thing that concerns them is their personal dignity . Anna, for example, who at first seemed to devote herself to satisfying her grumpy husband, turns out now to be most concerned with manicuring what she claims was her once-beautiful hands. The mink coat is a further indulgence in self-decoration. Eventually the selfish acquisitiveness of these two malcontents commits them to further, more desperate acts. So the episode’s final grisly twist may be an appropriate and ironic comeuppance, but it may also leave you a little chilled. I have discussed the problematic nature of the notion of "dignity" elsewhere. See for example my reviews of The Last Command (1928), Bicycle Thieves (1948), and Tangsir (1974).